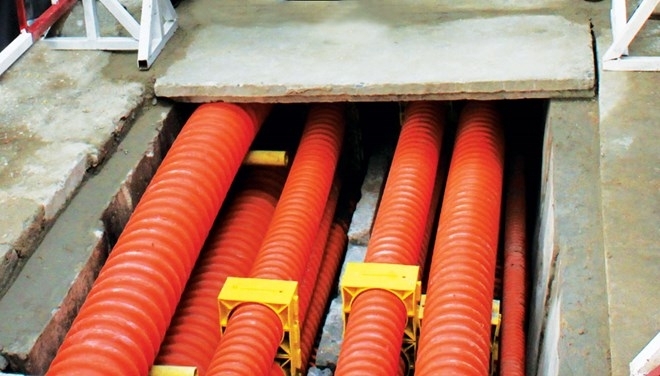 Hanoi Electricity Corporation (EVN Hanoi) will spend about 1.5 trillion VND (64.8 million USD) to bury electrical wires and telecommunication cables underground along city streets this year. Deputy Director General of the corporation Nguyen Anh Tuan said the work aims to improve the urban look, as well as increase quality of the company’s power service. Tuan said last year, the corporation finished work on 74 streets, burying 127.6 km of electrical wires and 69 km of telecommunication cables. This year, the work will continue on 56 streets. Hanoi People’s Committee recently announced a plan to re-surface pavement on nearly 300 streets in the city with natural stone, tezzarro tiles or concrete bricks. The re-surfacing is for streets where electrical wires and telecommunication cables are already underground. Tuan said to meet increasing demand for power during the summer, the corporation has made plans on power supply since late last year. He said during this summer, when the temperature exceeded 36 degrees Celsius, the corporation will not make power cuts to maintain the system. “Any problem that occurs in the power system in the city will be fixed within two hours,” Tuan said, adding that last year, the corporation did a good job in responding to power-supply problems. Tuan also called on people to use electricity economically, especially during the next few months when northern provinces and cities including Hanoi experience hot weather.